PEG brings together IST (Engineering School of the Technical University of Lisbon), FEUP (Faculty of Engineering of the University of Porto) and INESC. IST is the largest engineering school in Portugal, with about 8000 undergraduate and 1500 graduate students, and 700 professors. FEUP has about 5000 undergraduate and 1000 graduate students and 400 professors. These two schools are not only the biggest and oldest in Portugal, but still account for about two thirds of the engineers who graduate annually in Portugal. INESC is a private nonprofit research institute, the owners of which are IST, the University of Porto and the University of Coimbra, with a substantial share belonging to Portugal Telecom. It is located in Lisbon, Coimbra and Porto, and its researchers are mostly professors from the universities mentioned. Both IST and FEUP have several departments in which the general field of information technology is a major discipline. In both schools, IT first became a topic of research in the Departments of Electrical Engineering. Later on, autonomous Informatics Departments were created. Nevertheless, the area has many active researchers in other departments such as industrial engineering and management, mechanical engineering and mathematics. But let us revisit history in order to clarify some aspects of the science and technology panorama in Portugal today. In the early 90s there was a significant input of resources for science and technology, leveraged by EC funding. Large programmes directed to science (CIENCIA) and industrial development and innovation (PEDIP) helped some institutions to grow and others to come into existence. However, EC money requires that there be additional national funding to support the venture, and this caused problems for some institutions. Growing is sometimes a difficult process and can cause significant stress. Unfortunately this happened to INESC and since in these situations, attention and resources tend to be focused on the immediate and local crisis, leaving ERCIM was one of the consequences. However, the personal links were never lost and a return to ERCIM was always intended. Several attempts were made and it was always possible to count on the good will and patience of ERCIM officers. Meanwhile, INESC itself evolved. From a monolithic country-wide institute, it was split into six autonomous organizations (three in Lisbon and one each in Porto, Coimbra and Aveiro). These institutions are independent, with their own boards, strategies and areas of expertise. Their profiles are also different, but with one exception, they maintain a mutual link through INESC by means of a share in their 'capital'. The exception is Aveiro, which became totally independent. 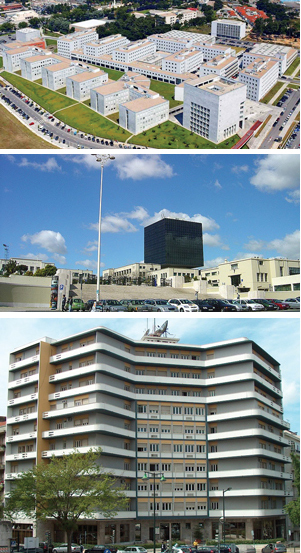 Sites of the PEG member institutions: From top: Faculty of Engineering of the University of Porto (FEUP), Engineering School of the Technical University of Lisbon (IST), and INESC. By the late 90s, there was a renewed surge in Portuguese science. Since then, science indicators have increased strongly and there is a younger, active and much larger community both in universities and research centres. An institutional assessment process covering all R&D institutes and centres was started and made public. As a result and by means of a contract with the Ministry of science and Technology, a small number of centres recognized as 'very good' or 'excellent' took on the label of 'associated labs'. This meant that certain responsibilities and benefits accrued to them. The initial number of about ten labs increased to about 25, including three of the INESC institutions: INESC Porto, INESC-ID Lisbon and INESC MN (Micro-Systems and Nanotechnologies), also in Lisbon. It is this new INESC reality, together with IST and FEUP in Porto, that shaped PEG: an agreement was reached and a Portuguese institution was finally able to apply to ERCIM in 2007. We are proud to have been accepted and are very positive about the benefits of joining such a European-wide organization, to which we hope we can also contribute. At a national level, PEG is not intended to be a closed consortium, and contacts and negotiations to join have started with other universities.